Strech Plastics Custom Golf Cart Light Kits. We offer custom golf cart light kits in several finishes. Some cutting of cowls is required and each kit includes easy to follow templates. BILLET ACCESSORIES • DASH TRAYS COOLERS & BRACKETS • WINDSHIELDS STEERING WHEELS • STORAGE COVERS COWLS • DASHES • REAR SEAT KITS MIRRORS • SAND & SEED BOTTLES WEATHER ENCLOSURES • LIFT KITS STEERING WHEEL COVERS • RAMPS WHEELS • TIRES • TRAYS • PEDAL SETS WHEEL COVERS • AND MUCH MORE . . .
Strech Plastics, Inc. 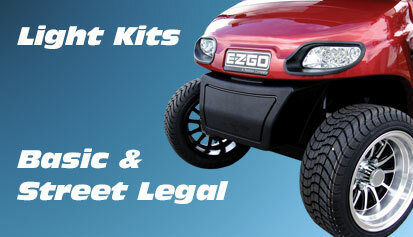 Manufacturer and Distributor of the Highest Quality Golf Cart Accessories. We manufacture and distribute a complete line of custom wholesale golf cart accessories for Club Car, EZ-GO, Yamaha, and other OEM's.